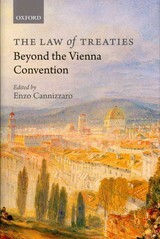 The law of treaties beyond the Vienna Convention / edited by Enzo Cannizzaro. Oxford University Press, 2011. This book offers a comprehensive analysis of the law of treaties as it emerges from the interplay between the 1969 Vienna Convention on the Law of Treaties and customary international law. It revisits the basic concepts underlying the provisions of the Vienna Convention, so as to determine the actual state of the law and its foreseeable development. In doing so, it examines some of the most controversial aspects of the law of treaties. Andrew B. Serwin. Privacy, security and information management: an overview. American Bar Association, 2011. Information security and privacy issues are not new, but mass attention and compliance efforts are at an all time high. 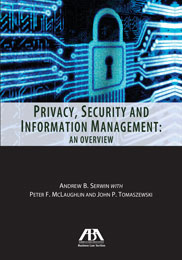 This book discusses current hot topics in information security and privacy including pretexting; financial privacy; privacy litigation; outsourcing to foreign countries; electronic health and personal records; and social networking. The book also examines the large number of laws have been passed to regulate information security and privacy issues. The Clean Air Act handbook / edited by Julie R. Domike, Alec C. Zacaroli. 3rd ed. American Bar Association, c2011. Managing e-discovery and ESI : from pre-litigation through trial / edited by Paul Grimm, Michael Berman, Courtney Barton. American Bar Association, c2011. Making and unmaking intellectual property : creative production in legal and cultural perspective / edited by Mario Biagioli, Peter Jaszi, Martha Woodmansee. University of Chicago Press, c2011. Bronwyn Anne Leebaw. Judging state-sponsored violence, imagining political change. Cambridge University Press, 2011. Sara McLaughlin Mitchell, Emilia Justyna Powell. Domestic law goes global : legal traditions and international courts. Cambridge University Press, 2011. The Oxford handbook of empirical legal research / edited by Ptere Kane, Herbert Kritzer. Oxford University Press, 2010. Jason Puckett. Zotero : a guide for librarians, researchers, and educators. Association of College and Research Libraries, 2011. Thomas G. Cannon. Equal justice : a history of the legal aid society of Milwaukee. Marquette University Press, c2010. Adenrele Oladapo-Jimoh. Futures market and its effect on rising oil prices. University of Houston Law Center, 2011. A review of disaster medical preparedness : improving coordination and collaboration in the delivery of medical assistance during disasters : hearing before the Ad Hoc Subcommittee on State, Local, and Private Sector Preparedness and Integration of the Committee on Homeland Security and Governmental Affairs, United States Senate, One Hundred Eleventh Congress, second session, July 22, 2010. China's indigenous innovation trade and investment policies : how great a threat? : hearing before the Subcommittee on Terrorism, Nonproliferation, and Trade of the Committee on Foreign Affairs, House of Representatives, One Hundred Twelfth Congress, first session, March 9, 2011. Permanent provisions of the PATRIOT Act : hearing before the Subcommittee on Crime, Terrorism, and Homeland Security of the Committee on the Judiciary, House of Representatives, One Hundred Twelfth Congress, first session, March 30, 2011. The issue of potential impacts of global warming on recreation and the recreation industry : hearing before the Committee on Environment and Public Works, United States Senate, One Hundred Tenth Congress, first session, May 24, 2007. The importance of basic research to United States competitiveness : hearing before the Subcommittee on Technology, Innovation, and Competitiveness of the Committee on Commerce, Science, and Transportation, United States Senate, One Hundred Ninth Congress, second session, March 29, 2006. North Korea's sea of fire : bullying, brinkmanship, and blackmail : hearing before the Committee on Foreign Affairs, House of Representatives, One Hundred Twelfth Congress, first session, March 10, 2011. The Social Security Administration's employment support programs for disability beneficiaries : hearing before the Subcommittee on Social Security of the Committee on Ways and Means, U.S. House of Representatives, One Hundred Eleventh Congress, first session, May 19, 2009. Reauthorization of the PATRIOT Act : hearing before the Subcommittee on Crime, Terrorism, and Homeland Security of the Committee on the Judiciary, House of Representatives, One Hundred Twelfth Congress, first session, March 9, 2011. Reauthorization of the Adam Walsh Act : hearing before the Subcommittee on Crime, Terrorism, and Homeland Security of the Committee on the Judiciary, House of Representatives, One Hundred Twelfth Congress, first session, February 15, 2011. Natural gas service outages in New Mexico : hearing before the Committee on Energy and Natural Resources, United States Senate, One Hundred Twelfth Congress, first session, to receive testimony regarding recent natural gas service disruptions in New Mexico and the reliability of regional energy infrastructure, Albuquerque, NM, February 21, 2011. The state of the credit union industry : hearing before the Committee on Banking, Housing, and Urban Affairs, United States Senate, One Hundred Eleventh Congress, second session, on examining the health of the credit union industry as we emerge from the financial crisis and recover and grow our economy, December 9, 2010. Reauthorization of the pipeline safety program : hearing before the Committee on Commerce, Science, and Transportation, United States Senate, One Hundred Ninth Congress, second session, November 16, 2006. Overview of U.S. relations with Europe and Eurasia : hearing before the Subcommittee on Europe and Eurasia, Committee on Foreign Affairs, House of Representatives, One Hundred Twelfth Congress, first session, March 10, 2011. The lifesaving role of accurate hurricane prediction and preparation : hearing before the Subcommittee on Disaster Prevention and Prediction of the Committee on Commerce, Science, and Transportation, United States Senate, One Hundred Ninth Congress, first session, September 20, 2005. Hurricane Katrina and communications interoperability : hearing before the Committee on Commerce, Science, and Transportation, United States Senate, One Hundred Ninth Congress, first session, September 29, 2005. America the beautiful : promoting our national parks as travel destinations : hearing before the Subcommittee on Competitiveness, Innovation, and Export Promotion of the Committee on Commerce, Science, and Transportation, United States Senate, One Hundred Eleventh Congress, second session, April 27, 2010.